Tao is really three venues in one: a lounge, an Asian restaurant and sushi bar, and a nightclub and outdoor pool! The Nightclub at Tao is a 10,000 square-foot Nightclub that attracts some of the top stars and celebrities in the world. Everyone from world class DJs and VIPS to celebrities like Madonna, Jay Z, Usher, Drake, Rihanna, Heidi Klum, Kim Kardashian, Jamie Foxx and Bono visit Tao. 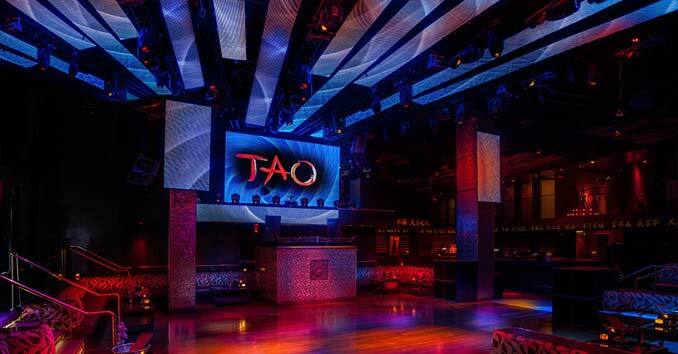 Tao has three full-service bars, two main rooms playing a variety of hip hop, electronic dance music, and top 40, state-of-the-art audio and lighting systems, private skyboxes, and a 40-foot outside terrace overlooking the Las Vegas Strip.